You’ll need some cooked chicken or rotisserie chicken cut into bite size pieces. 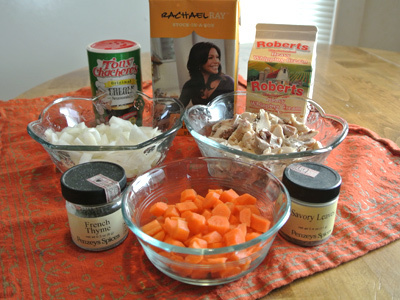 Also some chopped onion, carrots, chicken stock, heavy cream, creole seasoning, thyme and savory. 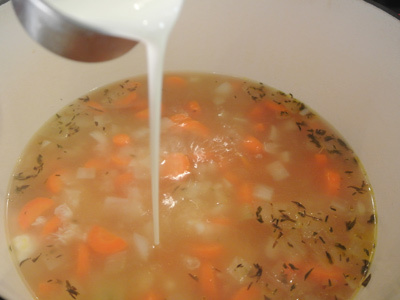 Add a drizzle of olive oil to a dutch oven or heavy bottomed stockpot. Heat over medium high heat and add the carrots and onions. Stir the pot while the onions sweat it out. Add the seasonings and stir the pot some more. When the onions become translucent, add in the box of chicken stock. 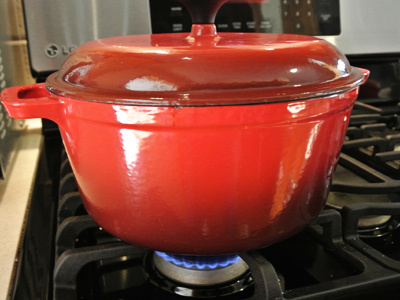 Bring just to a boil, then replace the lid and turn the heat down to simmer for 15 minutes. By this time the carrots should be soft. If not place the lid back on and cook an additional 5 – 10 minutes more. 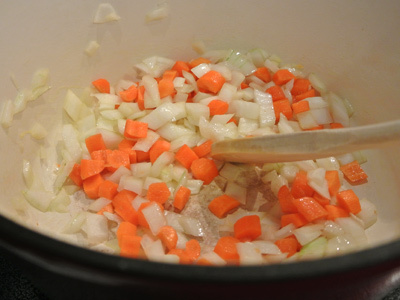 Add the heavy cream when the carrots and onions are cooked through. I’ve made several different recipes for dumplings and I like Elise’s recipe from “Simply Recipes” the best. 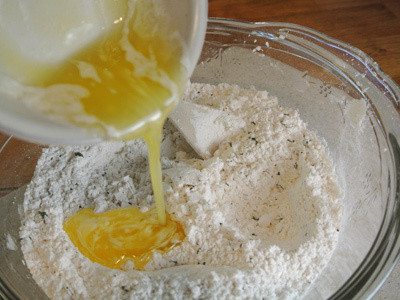 She uses cake flour instead of all purpose flour which makes the dumplings light and fluffy. I substituted half and half for the whole milk since it was what I had on hand. 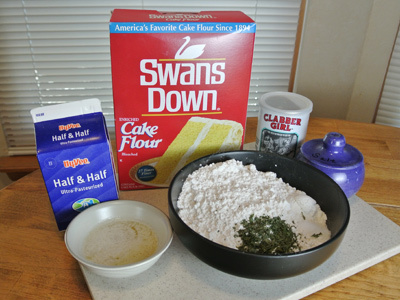 Also needed is some baking powder, salt, herbs of choice and melted butter. 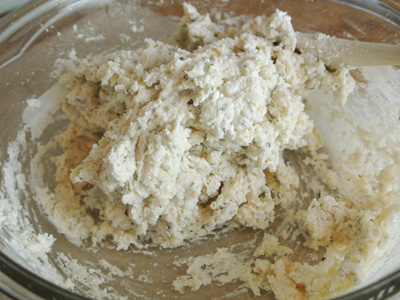 Stir the dry ingredients and herbs together in a bowl. Add the melted butter and stir. Next comes the half and half. Stir just until all the dry ingredients have been incorporated. It’s a goopy mess . . . 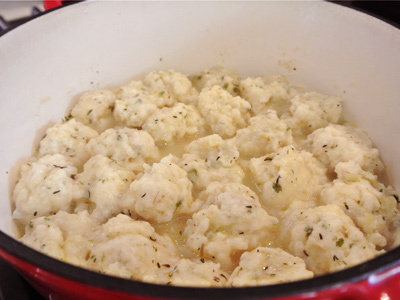 While your soup is simmering on the stove, drop tablespoon amounts of dumpling dough into the pot. They will float to the top. When the pot is full, stop. Now place the lid on and leave it on for 15 minutes. The dumplings need to steam so don’t be tempted to lift the lid or you will release the precious steam. After 15 minutes the dumplings are soft, light and fluffy. 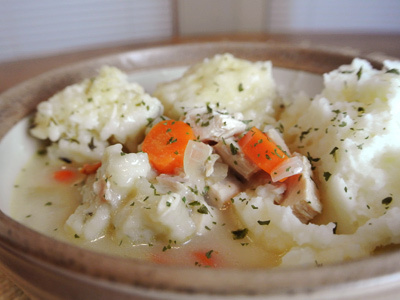 I like to add a big ole dollop of mashed potatoes to a bowl on one side and ladle in some chicken and dumplings on the other side. The soup is like dumpling gravy for the mashed potatoes and it tastes so good. Heat a dutch oven over medium high heat and drizzle olive oil in the pan. Saute onions and carrots until onions become translucent. 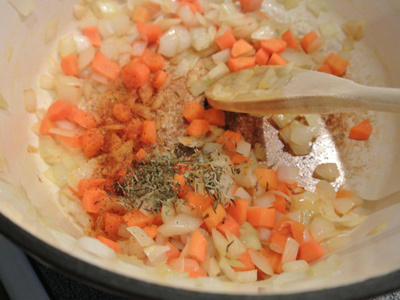 Add the creole seasoning, thyme and savory to the pot and stir. Add the box of chicken stock and bring just to a boil. 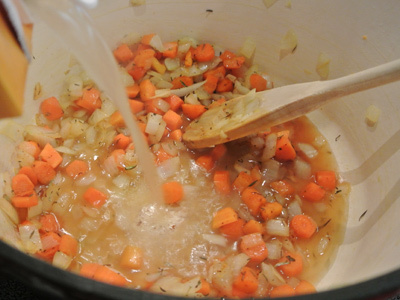 Replace the lid on the pot, reduce the heat and simmer for 15 minutes or until the carrots are tender. 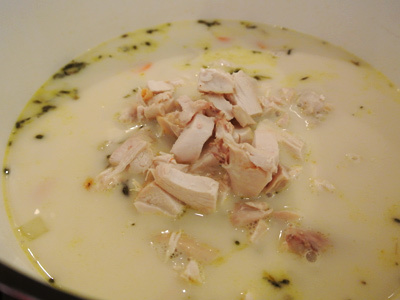 Pour in the heavy cream and add the chopped chicken. Turn the heat to low and simmer. 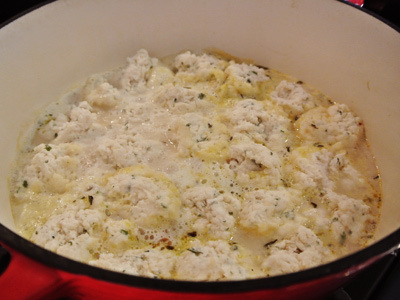 Drop dumpling dough with a spoon (about the size of a tablespoon) into the simmering pot. The dumplings should float to the top. 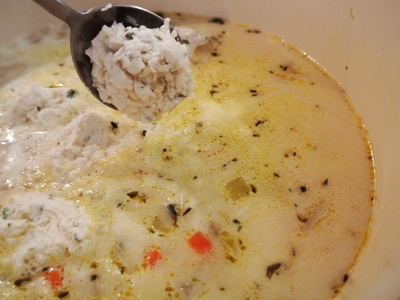 Drop dough until you have filled the top of the soup. The dumplings will expand when steamed. Place the lid on the pot and steam for 15 minutes. Test the dumplings with a toothpick to see that they are cooked through. 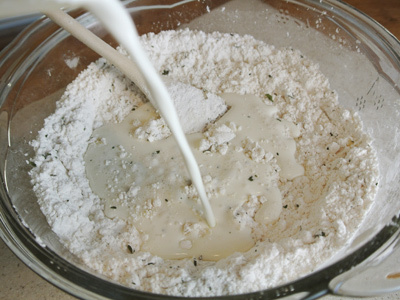 If needed, replace the lid and cook an additional 5 – 10 minutes. Serve with a side of mashed potatoes if desired. I can go for a big bowl of this right now! 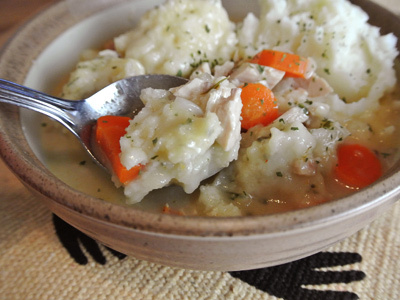 I love chicken and dumplings. It’s so perfect this time of the year, especially when it’s super cold out. Lovely post Jan! Thanks, when I made this the temp was in the teens! 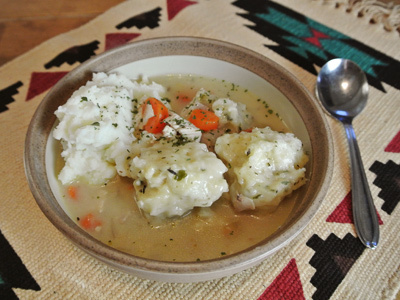 It’s a great comfort bowl for those cold days!